“God conversed with men, and made known unto them the plan of redemption, which had been prepared from the foundation of the world” (Alma 12:30). Upon seeing that “the words of Amulek had silenced Zeezrom,” Alma took advantage of the situation to “unfold the scriptures beyond that which Amulek had done” (Alma 12:1). One of the topics Alma expounded on was “the mysteries of God” (vv. 9–11). These sacred teachings included topics concerning Adam and Eve in the Garden of Eden, the Fall, temporal and spiritual death, the probationary state of humankind, the Resurrection, and Final Judgment. Essentially, Alma taught the Ammonihahites “the plan of redemption, which had been prepared from the foundation of the world” (Alma 12:30). This he did to answer a question posed by “one Antionah, who was a chief ruler” of the Nehorites in Ammonihah (v. 20). He and Alma’s accusers had set up an alternative, paid priesthood, which directly challenged the doctrines and ordinances of the Nephite priesthood in the land of Zarahemla. These Nehorite priests were schooled and organized, and they believed in the Creation and redemption of all men (Alma 1:4). They knew about the scriptures, but they propounded alternative doctrines from them. “What does the scripture mean,” Antionah asked Alma, “which saith that God placed cherubim and a flaming sword on the east of the garden of Eden, lest our first parents should enter and partake of the fruit of the tree of life, and live forever?” (Alma 12:21). Said another way, Antionah was asking a question related to how men and women could overcome the effects of the Fall and return to the presence of God. The premortal existence (Alma 13:3–5). Adam and Eve’s “partaking of the forbidden fruit” (12:21–23). “Cherubim and a flaming sword” guarding the way to the tree of life (12:21). The resulting death and mortal probation as a time given when men should “prepare to meet God” (12:24). Angels being sent to converse with and teach Adam and Eve (12:29). Angels teaching men to “call on his [God’s] name” and to make “known unto them the plan of redemption” (12:30). Men being given commandments and warned of the penalty for doing evil (12:32). Sacred ordinances given to make one’s garments “pure and spotless before God” (13:12). Being ordained after a “manner” that involved being “called with a holy calling,” and being “ordained with a holy ordinance” (13:8). Being sanctified, and entering into God’s rest through humility, repentance, and obedience (13:13, 28-29). The great King Melchizedek as an example of one who preached repentance unto his people, “and behold, they did repent” (13:14–18). All this “being a type of his order,” given to help people look forward to and rely on “the Son of God . . . for a remission of their sins” (13:16). Alma promised that those who followed the path of humility and repentance in their probationary state would “have claim on mercy through [God’s] Only Begotten Son, unto a remission of his sins,” and would enter into the rest of God (Alma 12:34). Adam and Eve served as Alma’s archetypes for this process, and he couched his teachings in terms of their own fall and redemption. As such, Valletta concluded, “There seems to be a strong link between the pattern of these teachings and the Nephite temple ceremony,” which was likewise oriented towards admitting the faithful into God’s presence. Alma knew that his opponents were serious challengers, and he gave them the strongest answers he could. As the High Priest of the temple in Zarahemla, he spoke powerfully of eternal truths. He drew on scriptures and sacred ordinances that the Nehorite priests would have known about to some extent. He invited them to repent by testifying to them that “there were many who were ordained and became high priests of God.” Alma taught that the people in Ammonihah could find rest, but only “on account of their exceeding faith and repentance” (Alma 13:10). By using the temple as a framework behind his spontaneous answer to Antionah’s question, Alma’s reply was clear and forceful; much more than a mere hodgepodge of biblical imagery. Gerald E. Smith has argued that the “Eden ascension narrative,” as he calls it, found in Alma 8–14 is a coherently structured elaboration of ancient Israelite temple theology. 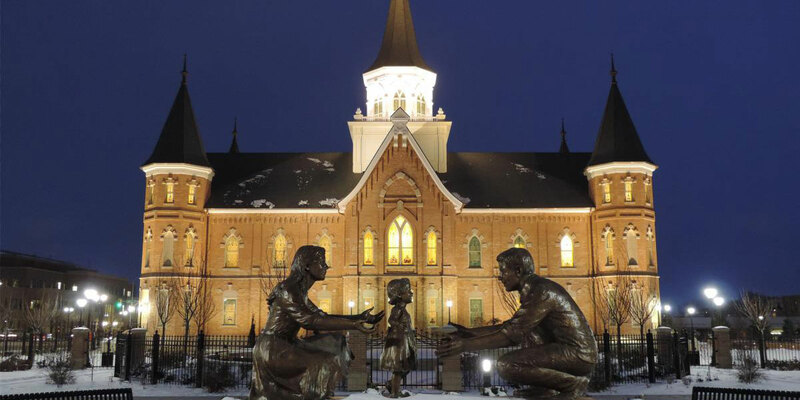 He also proposed that Joseph Smith’s restoration of the temple ordinances drew on this same biblical tradition and presented it in a way remarkably similar to what’s found in the Book of Mormon. Rather than persisting with the prevailing notion that the fall of Adam was the origin of evil and death, the Book of Mormon reframed Adam as a divine son of God, showing the faithful the ascension path to return to the presence of God through symbols, rituals, and narratives that appeared similar to the earliest . . . traditions enshrined anciently in the Israelite temple. In this the Book of Mormon completely bypassed traditional nineteenth-century theologies, pointing Joseph Smith toward a different path to doctrinal development that ultimately was enshrined in the theology of the Mormon temple. The fullness of the rites alluded to by Alma are experienced in the temple itself, because of their highly sacred nature. Likewise, the sacred drama of the Creation, the Fall, and humankind’s journey back into the presence of God is more fully unfolded in the temple. Nevertheless, themes and symbols associated with temple ordinances appear in the scriptures, both ancient and modern. Just as Alma’s discourse at Ammonihah points the faithful today towards the house of the Lord and encourages them to make and keep the covenants necessary to receive the blessings of eternal life and exaltation, his words gave his opponents in that apostate city an unmistakable opportunity to understand and to repent. While he did not convert many, “one of the most expert among them,” namely Zeezrom (Alma 10:31), was soon healed, converted, called and ordained to preach the word (Alma 15:5; 31:6). Gerald E. Smith, Schooling the Prophet: How the Book of Mormon Influenced Joseph Smith and the Early Restoration (Provo, UT: Neal A. Maxwell Institute for Religious Scholarship, 2015), 78–85. Thomas R. Valletta, “Conflicting Orders: Alma and Amulek in Ammonihah,” in The Temple in Time and Eternity, ed. Donald W. Parry and Stephen D. Ricks (Provo, UT: FARMS, 1999), 183–232. James T. Duke, “The Literary Structure and Doctrinal Significance of Alma 13:1-9,” Journal of Book of Mormon Studies 5 no. 1 (1996): 103–118. John W. Welch, “The Temple in the Book of Mormon: The Temples at the Cities of Nephi, Zarahemla, and Bountiful,” in Temples of the Ancient World: Ritual and Symbolism, ed. Donald W. Parry (Salt Lake City and Provo, UT: Deseret Book and FARMS, 1994), 2:297–387. John W. Welch, “The Melchizedek Material in Alma 13,” in By Study and Also By Faith: Essays in Honor of Hugh Nibley on His 80th Birthday, ed. Stephen D. Ricks and John M. Lundquist (Salt Lake City and Provo, UT: Deseret Book and FARMS, 1990), 2:238–72. For more on Zeezrom, Book of Mormon Central, “Why Would Zeezrom Attempt to Bribe Amulek? (Alma 11:22),” KnoWhy 118 (June 8, 2016). The word mystery in the scriptural sense essentially connotes sacred teachings reserved for the spiritually prepared. The mysteries are associated with sacred space, such as the temple, or with secret rites administered to those deemed worthy of initiation into holy orders. It ultimately derives from the Greek mystērion, meaning “secret rite,” and was used to describe the rites and festivals of the ancient Greek cults. A related word, mystēs, means the “one initiated” into the secrets of the given cult. See Liddle and Scott’s Greek-English Lexicon (Oxford: Claredon Press, 1891), 456. Hugh Nibley explained, “The word ‘mystery,’ as used by the early Jews and Christians (taught in secret to the apostles), was nothing else than a series of initiatory ordinances for achieving the highest salvation.” Hugh Nibley, Temple and Cosmos, The Collected Works of Hugh Nibley: Volume 12 (Salt Lake City and Provo, UT: Deseret Book and FARMS, 1992), 28; Andrew I. Miller, “‘Able to Know Heavenly Things’: The Ante-Nicene Mysteries and their New Testament Sources,” FairMormon Papers and Reviews 2 (2015). The basic Hebrew equivalent to this concept is the word sôd, meaning “confidential discussion,” “secret, scheme,” or “circle of confidants.” See Ludwig Koehler and Walter Baumgartner, The Hebrew and Aramaic Lexicon of the Old Testament, 2 vols. (Leiden: Brill, 2001), 1:745. Compare Stephen O. Smoot, “The Divine Council in the Hebrew Bible and the Book of Mormon,” Studia Antiqua 12, no. 2 (Fall 2013): 1–18; William J. Hamblin, “The Sôd of YHWH and the Endowment,” Interpreter: A Journal of Mormon Scripture 4 (2013): 147–154. Thomas R. Valletta, “Conflicting Orders: Alma and Amulek in Ammonihah,” in The Temple in Time and Eternity, ed. Donald W. Parry and Stephen D. Ricks (Provo, UT: FARMS, 1999), 193. Valletta, “Conflicting Orders,” 193–194. John W. Welch likewise has observed: “Based on the appearance of the following elements in Alma 12–13, the Nephite temple ceremony utilized familiar temple motifs, including abundant creation imagery regarding the fall of Adam and Eve (see 12:22–26), the redemption (see 12:25–33), the issuance of commandments (see 12:31–32), one’s calling (see 13:3–8), clothing (see 13:11–12), the facing of judgment (see 12:14, 32–35), and symbolic entrance into the presence of God (see 12:36; 13:12).” See John W. Welch, “The Temple in the Book of Mormon: The Temples at the Cities of Nephi, Zarahemla, and Bountiful,” in Temples of the Ancient World: Ritual and Symbolism, ed. Donald W. Parry (Salt Lake City and Provo, UT: Deseret Book and FARMS, 1994), 366. Alma, the High Priest, drew often on sacramental truths that can be related to temple themes, as he did in Alma 5. See Book of Mormon Central, “Why Did Alma Ask Church Members Fifty Probing Questions (Alma 5:14-15),” KnoWhy 12 (June 1, 2016). Gerald E. Smith, Schooling the Prophet: How the Book of Mormon Influenced Joseph Smith and the Early Restoration (Provo, UT: Neal A. Maxwell Institute for Religious Scholarship, 2015), 85.